In 2013, it really looked like the US federal debt was on its way down to depression era levels. Since then, the value of the USD has stopped following the decay curve with a Half-life of about 4 years, and instead has begun to slowly grow in gold value, rising about 35% from 19.5 mg to 26.4 mg. This has allowed the Federal Debt to resume its growth, rising from 300 kt in 2012 to 500 kt in June 2015. Even so, it is still far below its 2001 peak of 660 kt. As always, thanks so much for your work on Priced in Gold. I find it immensely useful and I appreciate your effort and perspective. 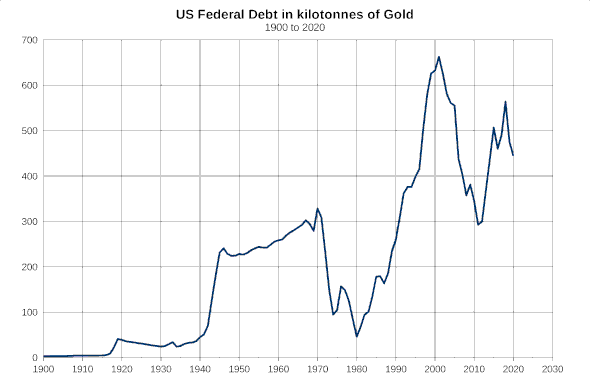 So, although federal debt has grown tremendously in dollar terms since 2000, the same debt measured in gold is -down-from 660 kilotonnes to around 500 (estimated) in 2015. In dollars, fed debt went from $5.5T to $10T under Bush II to $18T under Obama (so far). That is what some media reports and it sounds awful, 327%. Yet, it went -down- when measured in "real money," by about 25%. What am I missing here? Has not the situation deteriorated badly since 2000. Are we deeply concerned about rising debt (in dollar terms) for no reason? It seems inconceivable to me that with what the politicians have been doing — wars, crazy entitlement spending, etc., ad naseum — debt might truly be declining when measured in gold. I understand the dollar has been debased significantly since 2000, but if the government were mystically viewed as using gold for money, debt would be dropping? I feel I'm missing something obvious here. Help me understand better, please?! The key drivers of US Federal Debt are the big three entitlement programs, which denominate their spending in dollars. If those dollars fall faster in terms of gold, than the programs grow in terms of dollars, then the net is a decrease in terms of gold. On a related note, it looks like the fiscal responsibility Gingrich & Clinton may have been a bit overstated. The debt is being inflated away. @Andy: You say that debt is being inflated away, yet on this website we are talking about the debt measured by gold. I'm not sure I agree with the debt being inflated away even in dollars terms and *even* when using Shadow Stats measurements that are considerably higher than the government CPI. Yet if we view the debt priced in gold, the debt appears to be going down. That's hard for me to accept but you can read it in black-and-white pixels. Dear Sir. I would briefly like to add a perspective to what I think is happening concerning the US debt priced in dollars. To start with, I would say that trying to stay one step ahead of a thief, is like trying to know exactly what he wants to steal, when he wants to steal it and how he wants to steal it. To say the least , it is nigh on impossible. However, with hindsight (or history) you can perhaps begin to pick up some clues. Yes, on the face of it, US debt is falling in when expressed in terms of gold, however, what we are finding, is that the price of gold has been denied the opportunity of settling at its natural price. What we find is that, derivatives are being used to smash down the price in the form of naked shorting. Such that, we now have approximately claims of 150 people for every one ounce of gold. With the price of gold not reflecting its market value, the graph, I feel, is somewhat skewed to under report the true state of he American debt. @Newcomer: Natural price?! In whatever someone expresses one gram of gold it is always affected by supply & demand. Anyway, the chart shows for example how 'inflating public debt' worked, 1970-1980. And gold expressed in USD shows one the loss of purchasing power of this fiat currency against money, gold. Its not as clear as its mixed with productivity gains but thats another topic. Have a look at http://www.macrotrends.net/1333/historical-gold-prices-100-year-chart especially for the time 1970-1980. Similar effects are to be expected in the coming years. I agree with Newcomer. Gold is soooooo regulated it hurts. Short selling, Central Bank Manipulations (Swaps, and outright dumping.) JPM was manipulating LIBOR rates for 10 years before somebody noticed. With Most Day to Day people it draws a blank stare. Amazing they even mention it on the radio as a curiosity – BLANK BEEEEE STARE. There Used to be a USA GOLD forum (Black Blade et all.) that used to explain most likely causes, until one of them correctly predicted 08 crash and the huge liabilities due to derivatives (Cause of AIG crash).Approx 10 months in advance!!!!!. They closed the site down. Now its a sterile Business Report drivell . I Miss those guys. It's painful to see that in early 1980, when the National Debt was low and manageable, and gold was in a bubble, we could have paid off all of the debt with about 50 kilotonnes, it takes 10 times as much now. Since 1980 we had highly expanding deficits under every president, with Reagan, G.W. Bush and Obama at the top of the bad list, and Trump on target to be even worse if he gets re-elected. It's shameful and embarrasing for such a wealthy country to be unwilling to pay its current bills and instead pass them on to future generations, along with the accumulated interest. Half wants heavy tax cuts and high defense spending, the other half wants more educational, social and health benefits. Either takes more money than we are raising, can get elect a responsible president some day? We haven't in many decades.